LOS ANGELES (AP) - Four years ago photographer Andrew George approached the medical director of a Los Angeles hospital with an unusual request: He wanted to meet and take photographs of people about to die. 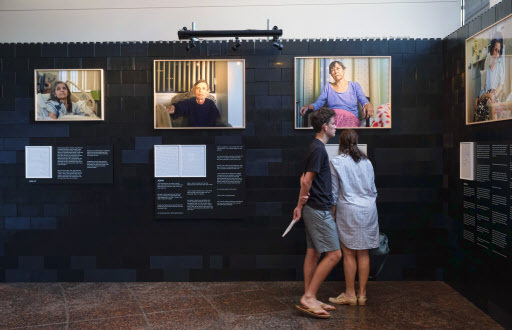 “I wanted to make a project about the universal challenge that we all have to address, and that is dying,” George said as he sat in a gallery in Los Angeles' Museum of Tolerance, where his photo exhibition, “Right, Before I Die,” opened last week. On the exhibition walls around him are 20 framed photos of dying people, each accompanied by some of the words they spoke as they described their hopes, dreams, happy moments and regrets while he photographed them. A commonality he found was that few seemed to fear death any longer. Not that any were in a hurry for it to come either. Many, although appearing frail and noting they were in much pain, still looked forward to just greeting the day. A few had regrets, although they no longer dwelled on them. “My wife wasn't the greatest love of my life. A Japanese girl was back in the ’40s,” a man named Jack is quoted as saying. The pair were teenagers when she was sent to a relocation camp during World War II. And although they planned to marry, they lost touch. “Thought about her the other day because I had a Japanese nurse. I hadn't thought about her in years,” said Jack, who is photographed connected to an oxygen tube. Of the people George photographed, only Nelly Gutierrez -- who has diabetes, liver failure, heart trouble and other ailments -- is still alive. The 63-year-old says she hangs on through pain and grueling treatments because she wants to see her family. That, and she likes to sing karaoke on the days she isn’t too exhausted by dialysis. She saw the white light of death once, she recalled, adding she believed it was heaven. But she argued with God that she wasn‘t ready to go because her kids still needed her. “And then I woke up,” she says with a smile as she checks out her photo. Coincidentally, the LA exhibition opened just days after a San Diego woman suffering from Lou Gehrig’s disease threw a farewell party for friends, then ended her life through assisted suicide. Dr. Ira Byock, founder of the Providence Institute for Human Caring, which is underwriting the exhibition, declines to offer an opinion on assisted suicide other than to say he's happy to see the debate about it over in California, where it is now legal. Now, the author of “Dying Well” says, medical professionals can concentrate on making a person’s final days as fulfilling as possible rather than arguing about how those days should end. He found an exception in Dr. Marwa Kilani, medical director of palliative care at Los Angeles’ Providence Holy Cross Hospital. She had heard so many interesting life stories from people during their final days, she told him, that she agreed it was important to share them with others who could learn from them and learn of the dignity people continue to possess even in their dying days. “Right, Before I Die,” opened last year at Belgium's Musea Brugge, moving on to San Francisco’s Grace Cathedral earlier this year. Future venues are being considered after it leaves the Museum of Tolerance at the end of September. “We're not an art museum, but there was something that resonated with me very much with the subject and the important themes of our museum,” said Liebe Geft, director of the facility dedicated to peace, tolerance and a remembrance of the horrors of the Holocaust.